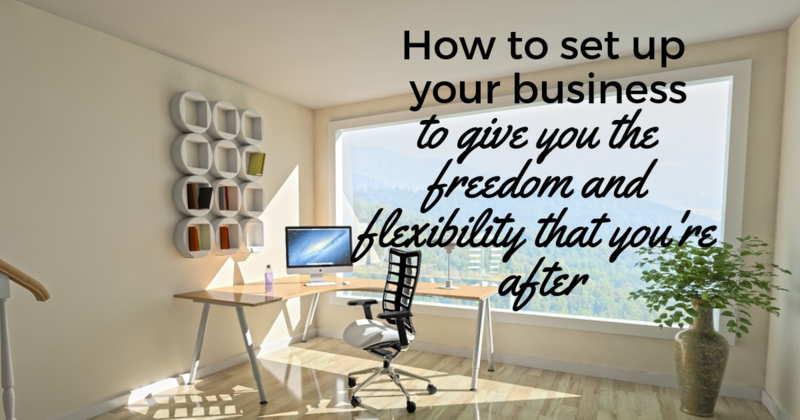 Okay, so we established that running your own business can be the best way to get the freedom and flexibility that you’ve been longing for. Hurrah! But although that’s true in theory, it doesn’t always turn out that way in practice. So many people find it much more difficult than they realised and, when they don’t see results right away, they give up and head back to a corporate job; or they stick with it but they hustle away, working harder than they did before and taking on projects that they don’t really want to do. Actually realising that freedom, flexibility and fulfilment requires you to set things up the right way from the beginning, to focus on the right things and to get the support you need. So how do you set up your business so it gives you all the things you hoped it would? My first premise is always that you have to define what ‘success’ looks like for you – ‘what’ you want – before you come up with a plan and get to the ‘how’. In last week’s post, we looked at our desire for ‘freedom’ and ‘flexibility’ – but what does this mean for you? What kind of freedom are you after – financial freedom (and, if so, what does that look like? ), creative freedom, autonomy, location independence…? And what about flexibility – do you want to be able to only work certain days, to be able to pick your kids up from school, or to work from home (or from anywhere)? Grab a pen and paper, sit down, and write out all the practical criteria that your business will need to fulfil in order for it to, literally, ‘tick all your boxes’! Aside from that freedom and flexibility, we also talked about the drive towards fulfilment: finding some meaning in your work and contributing positively to the world. I’m a big fan of the Okinawan concept of ikigai: your ikigai, or your reason for getting out of bed in the morning, is found at the point where you are doing something you’re good at, that you love, that the world needs, and that you can be paid for (that final point is important for this to be a viable business!). What are your top skills and strengths that you want to make the most of? What are you passionate about? What do you think the world really needs? Again, map out your skills and passions, along with your values and causes that you care about, and see what patterns you can find and how you might be able to bring it all together. Possibly the most important piece that will determine whether or not you get what you want – the freedom, the flexibility, and the fulfilment and ‘ikigai’ – is your business model. There are different frameworks for outlining your business model, with plenty of free templates you can find online (I have my own version that I teach in my programmes!). In a nutshell, it’s a plan for how you will run your business, including who your customers are, what products and services you will offer, and how you will make money. These different pieces all need to build on each other to ultimately deliver your version of success, including financial targets, the logistics of when and where you will work, and any other aspects that are important to you. This is not something you can create in a few minutes of brainstorming so make sure you dedicate proper time to look at things like how you will create multiple income streams, how you can best leverage your time, how you will set your prices, and so on, in order for your business to deliver on its promise. There’s no point in having a list of criteria and values and a business plan on paper – and then going ahead and saying “yes” to any job that comes along. You need to live and breathe your vision in practice. How can you translate your plans into concrete boundaries? For example, can you block your calendar so that you’re only available certain hours? What can you do to stick to that plan, for example, turning off notifications on your phone, closing down your laptop, and only checking during those pre-defined intervals? Will you commit to pushing back and, if necessary, saying “no” to projects with deadlines that interfere with your non-working hours or that aren’t a fit for your values or your business plan? Have a go at brainstorming really practical ways in which you can set, and stick to, your boundaries – maybe get your partner or your kids involved so that it works for all of you! The truth is that there will inevitably be ups and downs as you start and then run and grow your business, and if you want to make this last then you’ll need a whole lot of support. That support might take the form of a community (online or offline) where you’ll find like-minded people to cheer you on and help you stay motivated (the One Step Outside Facebook groupis a good place to start! ); finding podcasts and books to help you immerse yourself in the new topic and build your confidence that, yes, you can do this; or getting the right mentor and coach to inspire and guide you through the next phase (and I would say you really need all three!). Be honest with yourself and have a think about what challenges you might come up against, where your knowledge and skills gaps are, and where and how you can get the help you need. I hope these five steps will help you get started and, don’t worry, in the next few weeks, we will be getting into more details about what you can do in really practical terms when it comes to running your business – so come back and keep following along! If you’re looking for a mentor who is a few years ahead of you to coach you through the transition out of the corporate 9 to 5 and into running your own business, then get in touch to get started with a 30-minute clarity call!